In case you missed it last week, I revealed the room that I plan to makeover as part of the One Room Challenge this fall. You can check out all the Before photos, as well as my mood board for the new homework/craft room makeover here. 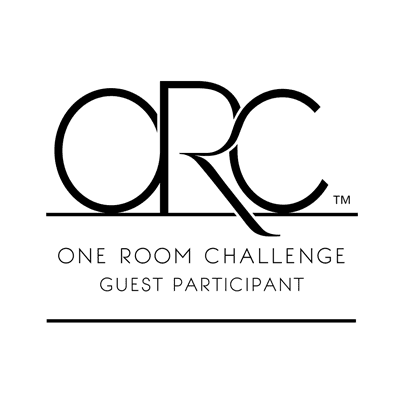 So here we are in Week Two of the One Room Challenge™ ! 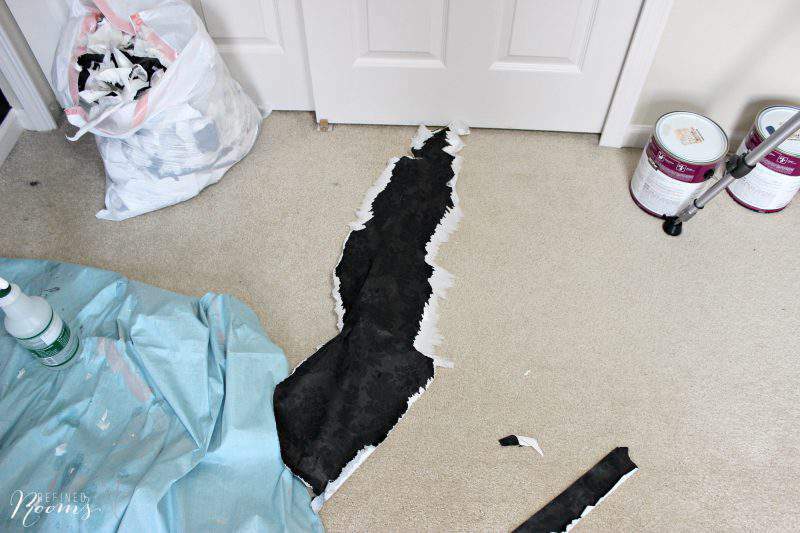 Today, I’ll share a bit more detail about the design plan, then dig right into a DIY tutorial on how to remove wallpaper. Ready?!? O.K.! Last week I shared the mood board that I created to give you a an idea of the direction I’m headed for this space. Today, I’m going to drill down a bit into the design plan. Overall Style: I’m going for a clean line, minimalist modern feel. I’m accomplishing this by incorporating modern furniture, lighting, and accessories. I’m also planning to use Royal Design Studio’s Contempo Trellis wall stencil to create a focal wall that will anchor the homework/study zone. 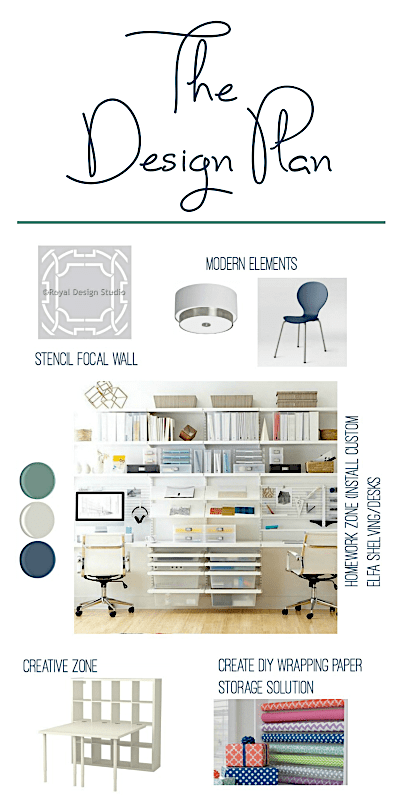 Homework/Study Zone: Continuing my love affair with the Elfa storage products, I plan to create a homework/study area using a custom Elfa design that consists of wall-to-wall shelving and a continuous desk surface that spans the entire wall. I’ll use an Elfa drawer system to divide the desk into “His” and “Hers” areas for my son and daughter. Creative Zone: On the opposite side of the room, I plan to use an IKEA Kallax workstation to store all things crafty, and FINALLY have a large work surface to work on DIY projects, wrap presents, and all that jazz. Since my large stash of wrapping paper that once lived under the guest room bed has been displaced, I plan to create some sort of DIY wall-mounted storage solution on the wall within the creativity zone. So that’s the plan in a nutshell! To execute the plan, the first order of business this past week was to bid farewell to this wallpaper. This is the wall that will soon be sportin’ that awesome stencil pattern, as well as the kiddo’s new homework zone. 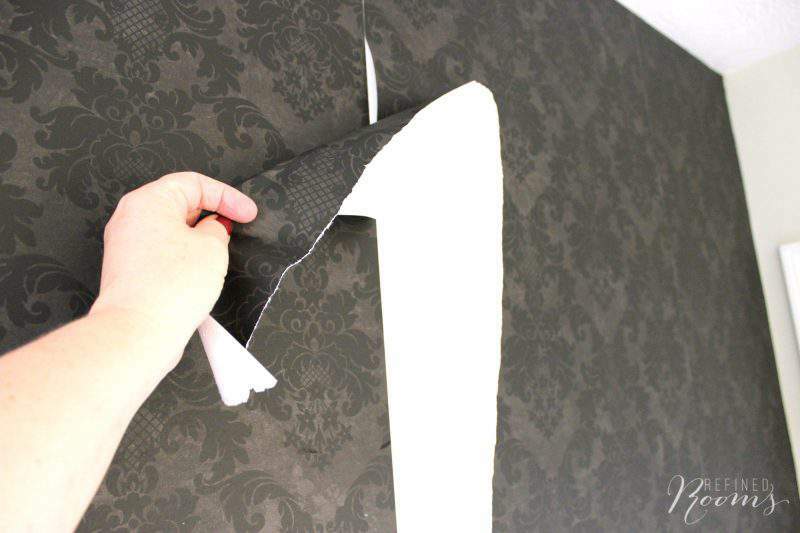 HOW TO REMOVE WALLPAPER LIKE A BOSS…WITHOUT CHEMICALS! If you’ve been around for awhile, you may recall me sharing my experience with wallpaper removal in the kitchen and powder room as we prepared to have our whole house painted. 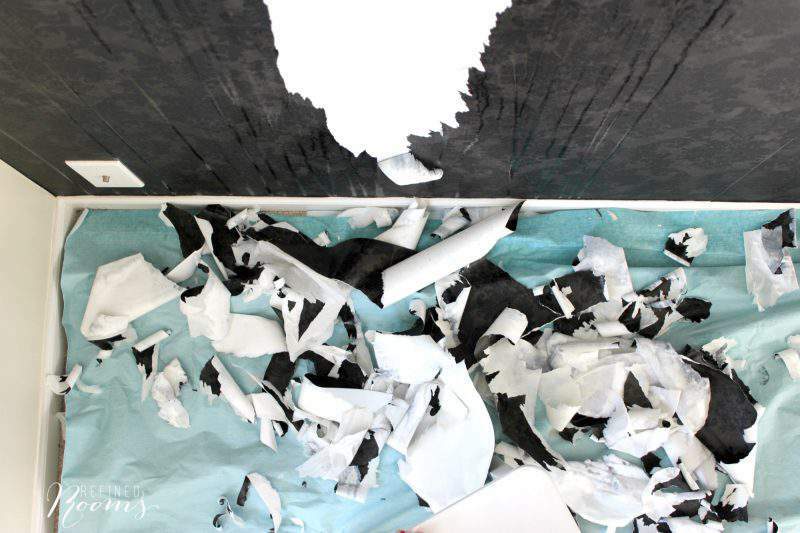 During that time, I learned a whole lot about how to remove wallpaper (more than I ever wanted to know). 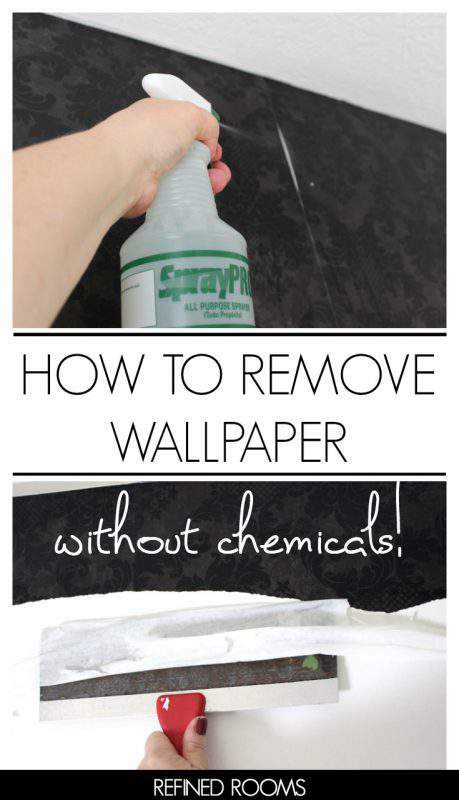 I researched different methods for wallpaper removal. I was on the hunt for a method that was cost-effective (i.e., I didn’t want to purchase or rent a wallpaper steamer) & one that didn’t involve using harsh chemicals. In that search, I came across people who recommended using various DIY concoctions like vinegar + water, dishwashing liquid + water, and even liquid fabric softener. But none of these options appealed to me because of the residual smell or mess that comes with these methods. Yup. That’s right. 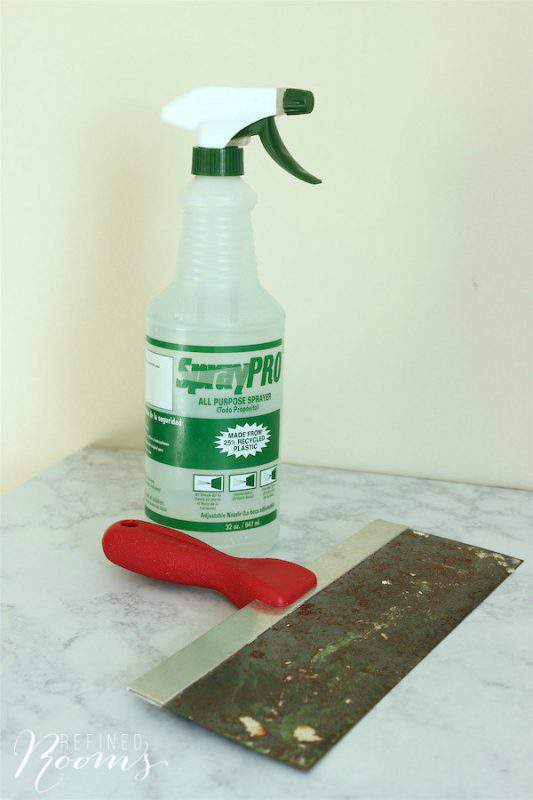 A spray bottle filled with super hot water and a putty knife! You need to begin by prepping your space. Ain’t gonna lie. Wallpaper removal is a messy process. Clear the area and lay down tarps to protect your floor, just like you would to prepare for painting. 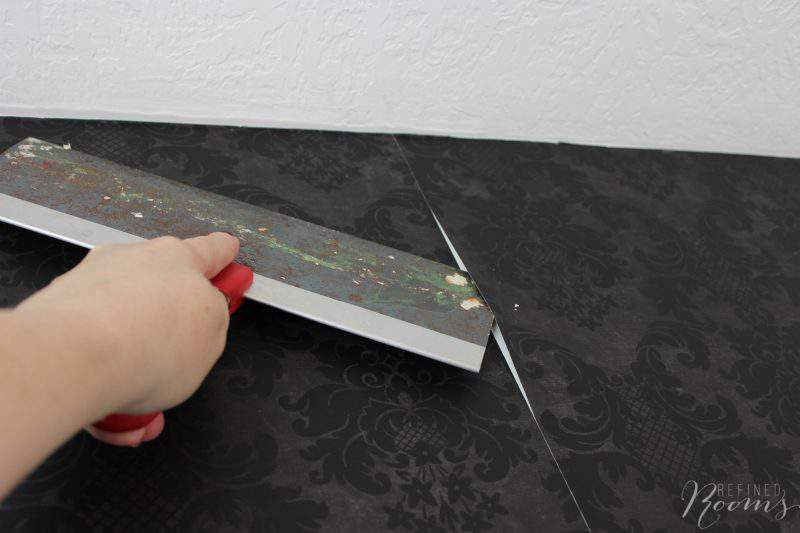 The main objective is to peel away as much of the top vinyl layer as possible in order to expose that paper layer that lies underneath. Once that paper layer is exposed, your mission is to soak the heck out of it with hot water (as hot as you can get it). 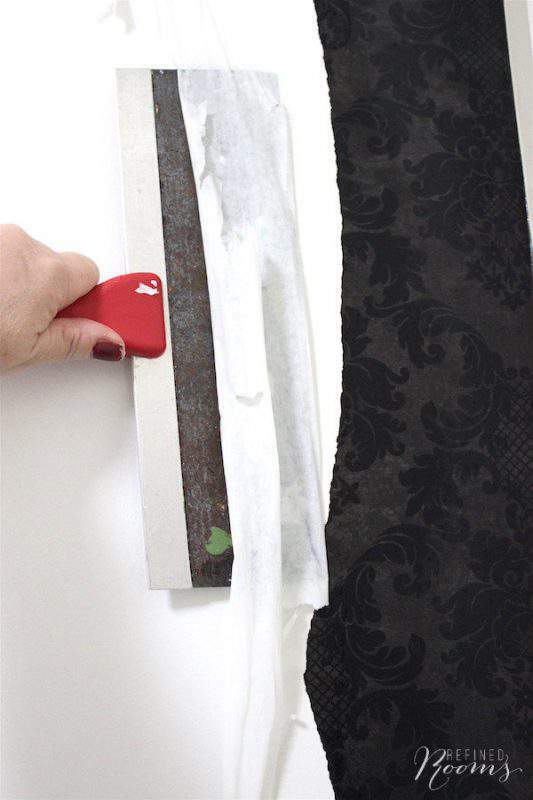 This process then reactivates the adhesive, and enables you to peel of the bottom paper layer from your wall. To get started, pick a spot to begin where paper easily comes up. 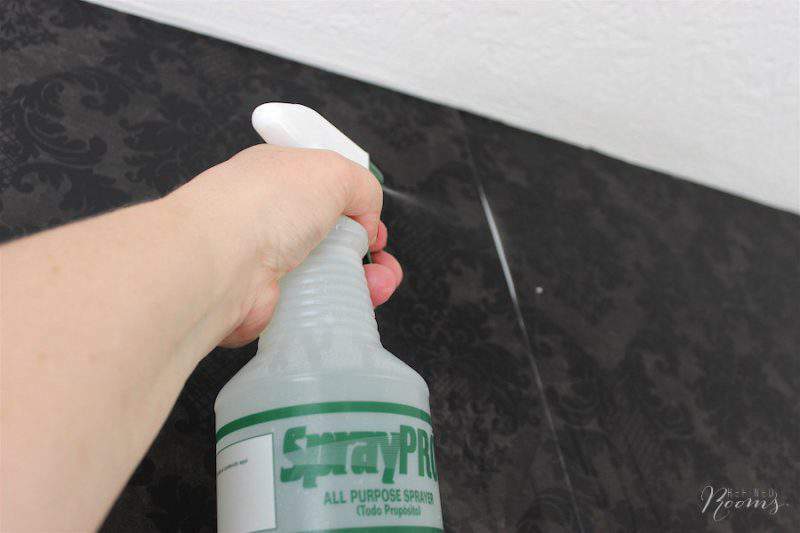 Spray hot water underneath the vinyl layer, then wait for a few minutes. 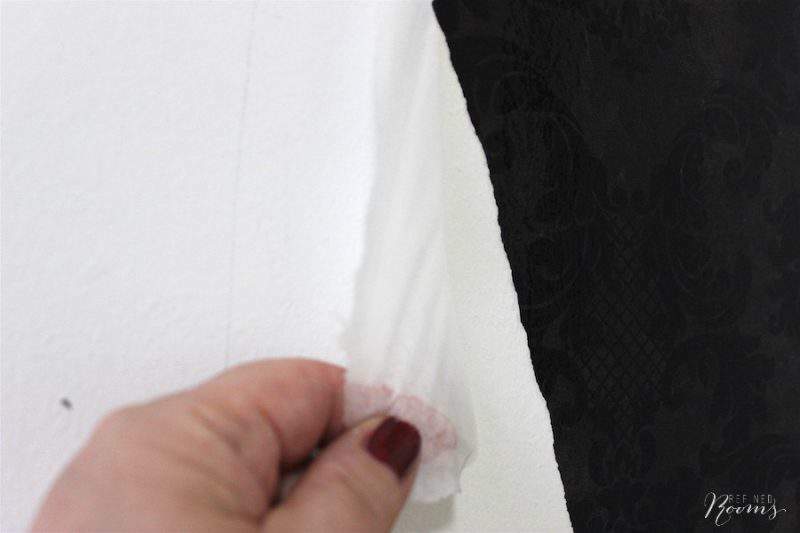 Tear off a piece the vinyl layer, exposing as much of that paper layer as possible. Once again, spray that paper layer until it’s complete saturated with hot water. Wait a few minutes and then work your putty knife underneath that second layer in order to remove it. Once you’ve successfully removed a chunk (ahh, so satisfying), use your putty knife to remove as much of the glue as possible. Now just “rinse and repeat” the process, working on either side of that original swath of paper that you first removed. 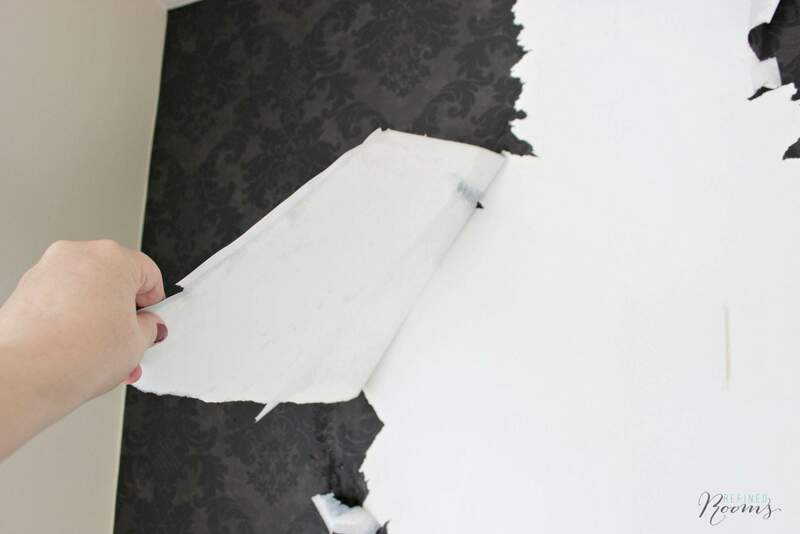 The next time you apply wallpaper, remember the ordeal you just went through and make it easier on yourself when it comes time to remove the paper by applying wallpaper sizing prior to installation! And I’ll close with a grande shout out to Linda from Calling It Home (and media partner House Beautiful) for hosting this fabulous challenge!! Be sure to visit all the featured bloggers and the guest participants through the links below. I’ve been luck enough to never have lived in a home with wallpaper. It sure does look like a pain. Can’t wait to see your room once it’s finished. Would love for you to stop by DIYHSH and link up to More the Merrier Monday. You’re lucky indeed Jamie! Of course, it’s self-inflicted in my case. I’m the one who installed it years ago LOL! I’ll be sure to check out More the Merrier Monday. Thanks for the invite! 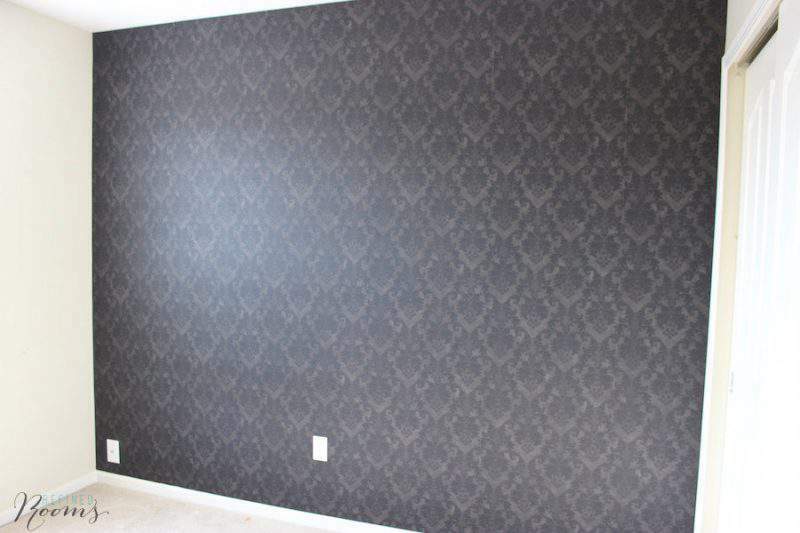 In my home owning adventures I have removed approximately 200 acres of wallpaper. That’s what it felt like anyway. I’ve had good luck with my hand held Shark Steamer.